REYNOLDSBURG, Ohio — Despite enduring the worst drought conditions in more than 50 years, farmers are likely to harvest the eighth-largest corn crop on record this fall, according to The World Supply and Demand Estimates report and Crop Production reports — released Sept. 12 by the U.S. Department of Agriculture. The reports projected an average corn yield of 122.8 bushels per acre (bpa), above analysts’ pre-report expectation of 120.5 bpa. The projected total crop size of 10.73 billion bushels (bbu.) also came in above the average expectation of 10.4 bbu. and is down less than 0.5 percent from the August estimate. Total supply for 2012-2013 is estimated at 11.98 bbu., up slightly from the August estimate due to an increase of 160 million bushels in carry-in. 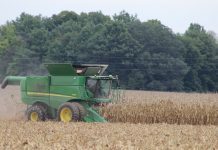 Based on conditions as of Sept. 1, Ohio’s average corn yield is forecast at 126 bushels per acre, unchanged from the Aug. 1 forecast and 32 bushels below last year’s state yield of 158 bushels per acre. 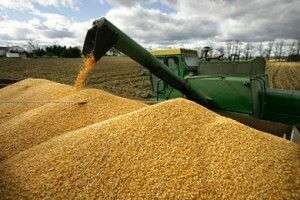 Total production is forecast at 456.1 million bushels, down 10 percent from 2011. 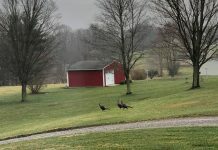 Ohio growers expect to harvest 3.62 million acres for grain in 2012, 400,000 acres more than in 2011. Pennsylvania corn is forecast at 125 bushels per acre, up from 118 bushels per acre Aug. 1, and up from the 2011 average of 111 bushels per acre. Ohio soybean yield is forecast at 40 bushels per acre, down 2 bushels from the Aug. 1 forecast and down 7.5 bushels from the 2011 state average. Total soybean production for Ohio is forecast at 183.2 million bushels, down 15 percent from the previous year. 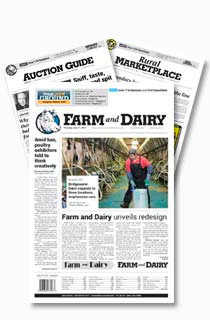 Harvested acreage is forecast at 4.58 million acres, up 40,000 from 2011. Pennsylvania soybeans are forecast at 45 bushels per acre, up 3 bushels from the Aug. 1 forecast, and down 2 bushels from the 2001 average. U.S. corn production is forecast at 10.7 billion bushels, down less than 1 percent from the August forecast and down 13 percent from 2011. This represents the lowest production in the United States since 2006. Based on conditions as of Sept. 1, yields are expected to average 122.8 bushels per acre, down .6 bushel from the August forecast and 24.4 bushels below the 2011 average. If realized, this will be the lowest average yield since 1995. Area harvested for grain is forecast at 87.4 million acres, unchanged from the August forecast but up 4 percent from 2011. U.S. soybean production is forecast at 2.63 billion bushels, down 2 percent from August and down 14 percent from last year. Based on Sept. 1 conditions, yields are expected to average 35.3 bushels per acre, down .8 bushel from last month and down 6.2 bushels from last year. Compared with last month, yield forecasts are lower or unchanged across the Great Plains and most of the Corn Belt as lingering drought conditions continued to hamper yield expectations. Area for harvest in the United States is forecast at 74.6 million acres, unchanged from August but up 1 percent from last year. On the demand side, USDA increased 2012-2013 livestock feed demand to 4.15 bbu., up 75 million bu. from last month’s report. Corn use for ethanol and co-products was unchanged at 4.5 bbu. Because approximately one-third of every bushel of corn used for ethanol returns to the feed market as distillers grains, feed use will account for approximately 5.5 bbu. in 2012-2013 on a net basis, compared to net corn use for ethanol of 3.15 bbu. Thus, on a net basis, ethanol use will account for 26 percent of the total supply, while feed use accounts for 46 percent. Projected exports were lowered slightly from last month to 1.25 bbu. Meanwhile, 2012-2013 carry-out was raised to 733 million bu., up 13 percent from last month’s projection of 650 million bushels. The increase in 2012-2013 carry-out is explained by higher carry-in that more than offsets slightly lower production and slightly increased demand. Average prices were reduced 30 cents/bu to $7.90/bu. Globally, USDA is still projecting the second-largest corn crop in history. 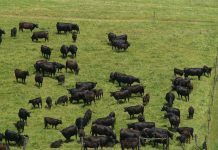 Production in Argentina is up more than 30 percent over last year, while Mexico increased output 19 percent, South Africa 17 percent, Canada 9 percent, and China 4 percent. At 2.71 billion metric tons, USDA is also expecting the total 2012-2013 grain supply (coarse grains, wheat, and rice) to be the second-largest ever. 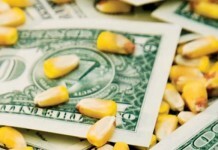 The U.S. ethanol industry is expected to use just 2.9 percent of the global grain supply in 2012-2013.